President Obama and Secretary of State John Kerry are well aware that the Iran deal is not enforceable. The sanctions genie is out of the bottle, and the mythical snap-back provision is overridden anyway by the treaty’s clause that grandfathers ongoing contracts. Contrary to the hyperbole and Internet petition drives, the people who are against the deal are not “war mongers” or motivated by lobbyists and dual allegiances. The administration knows that as well. The deal itself is one grand diversion, and the vituperative accusations just add to the distraction. This is not about some great conspiracy. This is about how the game of politics is played beneath the surface. It is about what the administration thinks the American people can accept and what it believes they cannot. Let us begin with the obvious. Nothing short of military operations will deter the Iranians from building nuclear weapons. The mullahs have sacrificed their economy, their standing in the world community, and their government’s legitimacy in order to acquire nuclear weapons. For the administration and most of our allies, war is not an option. The Obama administration embarked on a policy of giving the Iranians what they were going to get anyhow. According to former secretaries of state, Henry Kissinger and James Baker, the Obama administration parted company with three prior administrations that were willing to go to war to prevent Iran from acquiring nuclear weapons. The administration of George W. Bush would not trust Iran even to enrich uranium because, by 2004, it was well known that Iran was enriching uranium beyond the level required for peaceful uses. So why the change? The Obama administration knows that a war-weary America is not going to go back to the Middle East to stop the Islamic State. America has had enough of the Middle East and is leaving. For Mr. Obama, America should not be entangled in the Middle East and has not been a force for good. In contrast, Mr. Obama has an entirely different attitude toward what he perceives as mainstream Islam. This was reflected in his paean to Islam in his 2009 Cairo speech, his concern that NASA make Muslims “feel good” about their role in space exploration, and his convoluted and deceptive history about Islam’s contribution to America. The Iran deal is not about nuclear weapons. Iran was going to acquire these weapons anyhow. The deal is about bringing Iran back into the community of nations as a force for good that will put an end to the Sunni fanaticism so vividly seen in the behavior of ISIS and earlier in the rise of al Qaeda. By bringing Iran back into the community of nations, the president is betting the future of the Middle East on an Iran that will initially stop ISIS and eventually evolve beyond its current level of theological fanaticism. If the price of that is the destruction of the Gulf Sunni states and Israel, for Mr. Obama, it is a small price to pay. The Islamic State is after all a creation of Gulf Arab money, and Israel has not yielded to Mr. Obama’s blueprint for its own destruction. Iran was always going to get nuclear weapons, and it, like China, is too important to its region to be contained. 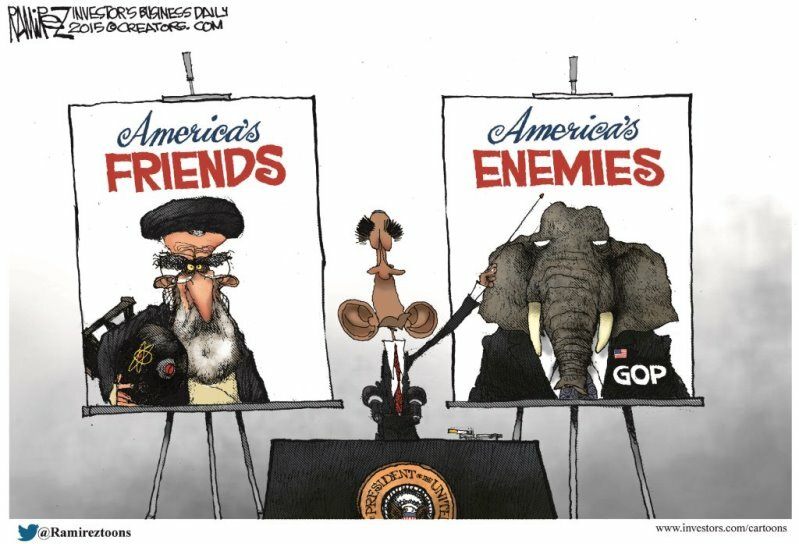 Mr. Obama wants to do for Iran what Richard Nixon did for China. This is his legacy, as is opening up relations with Cuba. The child reared by a Muslim stepfather and leftist grandparents sees the world quite differently from the rest of us, and much to the detriment of our strategic interests. We are all products of our socialization, political and otherwise. Regrettably, in Americans’ enthusiasm for Candidate Obama in 2008, they closed their eyes to who Mr. Obama is, and dismissed every incident that might have shed light on that issue as irrelevant to the charismatic figure making a historic race for the highest office in the land. We should have remembered that in politics there are numerous policy spheres where mistakes are reversible. When it comes to a nation’s strategic interests, often that is not the case. Mr. Obama has made an enormous and reckless bet on the future of America and the Middle East. It remains to be seen who will pay the price for it, and how. Abraham H. Miller is an emeritus professor of political science, University of Cincinnati, and a senior fellow with the Salomon Center for American Jewish Thought. This article originally appeared in The Washington Times and is reprinted with permission of the author. What If Obama Just Gave Gitmo Back to Cuba?